This week is the third birthday of ‘In a Vase on Monday’ hosted by Cathy at Rambling in the Garden. This week she asked us to join her and write on the theme of three. Cathy’s blog post really resonated with me, her kind words in my difficult times last year really helped me, as did her fellow gardening bloggers from all across the world. Reading their blogs and all the beautiful flowers lifted me so much… and inspired me to plant, prune and grow. I’ve picked three kinds of plants to represent three groups of my friends. Lacecap hydrangea – these are white, fading to pink and then finally the delicate brown of the lace which look beautiful through the winter. It’s planted in my front garden and it makes me smile every time I leave the house. 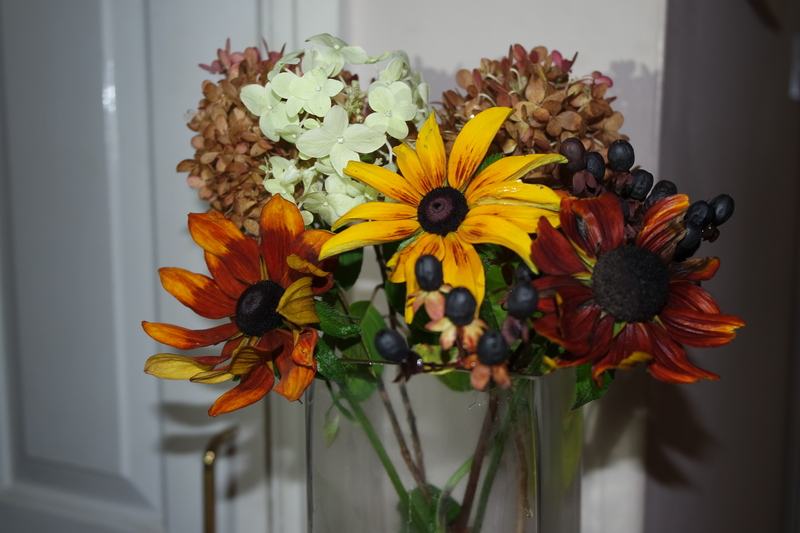 Rudbeckia – The dark one is ‘Cappuccino’; I don’t know the name of the bright yellow one. I bought it at Monton festival. There are hundreds of varieties of Rudbeckia. Hypericum – which has small yellow flowers in the spring which change to red berries in late summer and black berries in the autumn. This plant was in my front garden when I bought my house seven years ago. So much has changed since then but so much has stayed the same. My friends have helped me so much especially these last 18 months, just as my garden has. Writing my blog helped me too even though most of the time I was so exhausted, I could barely string a sentence together or take photos. I’m feeling so much better now, but my new role means reams reading, many people to meet and numerous projects to plan, so less time for getting outdoors, let alone blogging. My mission for 2017 is to be much more organised! my pals from work who come from so many places near and far (like the many varieties of Rudbeckia), some of them I’ve known for nearly 20 years and others are much more recent arrivals in my life. and my Monton pals who’ve always been here with me 🙂 like the Hypericum. The square vase is a gift from one of my oldest friends from University in Stirling – I’ve known her and my other Uni pals thirty years this autumn. How did that happen ;-)? I feel 31 in my head apart from when my arthritis, aches and pains are playing up. They’ve been such a support to me over so many years, but especially these last 18 months. Cathy also talks about how picking flowers for her Vase has made her very observant about her garden. This certainly chimes with me – noticing what is in my garden, what’s in bud, flowering, what’s gone over – and also what’s been munched by the slugs. It helps with my mindfulness, which is one of the activities which helps me daily. She also says it’s humbling to read how the meme has changed people’s lives. I know it’s changed mine. I know how much though goes into Cathy’s comments on every blog that links up to the meme. Her words helped me so much when I was feeling so overwhelmed and exhausted. And I’m sure this will make Cathy smile – as usual I’m late with my contribution. I don’t think I’ll count up how often I’ve actually posted on a Monday and how often I’ve missed the day – oops. Cathy says it doesn’t matter so I guess I’ll keep picking vases and posting them a bit late. It’s been a very hectic at work – and frankly it’s been another momentous week for the world. So I’ve been reflecting this week about remembrance, friendship and the future. This week I went to a public meeting about the plans for the new Royal Horticultural Society Bridgewater Garden on the site of Worsley New Hall in Salford. It’s called Bridgewater because the canal runs to the south of the site. There’s a sneak preview on the RHS website – and they’re asking the public for comments via email. The plans look wonderful, they will repair the walled kitchen garden, repair the Victorian cottages and bring them back into use. There will be low glass buildings, with cedar cladding and wild flower roofs. It goes to Salford planning committee in December, with work starting Spring 2017. There will be 140 jobs created at the garden, many volunteering opportunities, education, and support for schools, young people and the local community. They will repurpose the disused terraces and formal gardens, repair the lake and put in a new one. The first phase will open in 2019 (the area in the SW on the map) as the plants need to grow :-). The garden will be about a half hour walk from our house along the canal. I’ll be a regular visitor; just like my Mum who’s a regular visitor at Wisley. We often walk up to Worsley Green and the Woods, no one can believe how lovely it is despite being in the middle of the city. We’ve been getting out on more walks around Lancashire and Greater Manchester too, so fingers crossed I might get up a small hill or two next year. I can’t tell you how excited I am. It will be stunning… a new beginning. In other news, we think we’ve found our wedding venue for September 2017. It won’t be a surprize that it has a beautiful garden. My Chap is my rock – he has truly helped my soul blossom – he IS my new beginning. 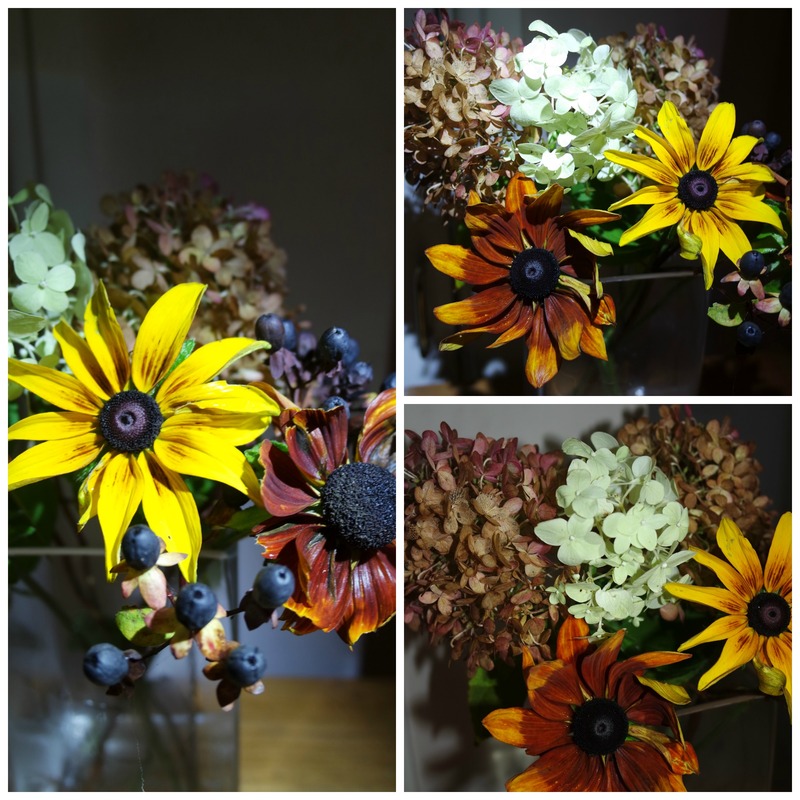 This entry was posted in In a vase on Monday, Women's Institute and tagged friendship, garden blogging, hydrangea, hypericum, In a vase on Monday, RHSBridgewater, rudbeckia, Women's Institute on November 14, 2016 by Bec - views from my garden bench. You might be late for last week but you are right on time for this week. Such a pretty arrangement. Lucky you still having rudbeckias in bloom. I like the Proust quote. I appreciated it as I am reading Swann’ s Way at the moment and this time I am detrrmined to finish it. especially if you haven’t got much time. I started with fuschias, lobelia and petunias etc with my Mum, when I was a little. Now is a good time to plant Sprint bulbs – like crocuses, daffs, iris (tulips can be planted right up to early Dec).